Entering is easy. Simply enter your name and email address in the box below. The winner will be selected on Friday, January 2 and notified by email. It's that simple! This giveaway is open to US residents only. Giveaway runs until Thursday, January 1 at 11:55pm EST. One entry per person, email address and IP address. Multiple entries will be disqualified. Editor's note: The entry box should be up and running again. Please give the page time for it to load -- and remember there is only one entry per IP address, so you may not be able to see the box if you have already entered. Thank you again for your patience and good luck! i could really use some great skin care products. I too couldn't find the entry box, so I hope this works. Please enter me in your giveaway. Thank you. The box would not let me leave my information so I hope this works. Thank you for the giveaway. Great prize! I hope this counts as an entry...the entry box was unusable. Box dont worl, but this does! Thanks for giveaway! Hope I win! The entry box worked for me. Thank you for the wonderful giveaway opportunity! Sounds like a nice package! I would love to be a part of the giveaway, but I do not even see a box to try to make it work. Please include me! At my age (64), I need all the help I can get -- THANKS !!!! wonderful products....no entry box......please add me! Nice prize. Count me in! My face could sure use this. Count me in, I'd like to win the Murad giveaway. I also couldn't get the box to work, to put my name and email address, so I am using the comments section like others above. Oh me too! How I would love to win this but the box simply wasn't working!!! Oh count me in?? Looks like a terrific prize!! Wasn't able to fill in the box, but am entering info here!! 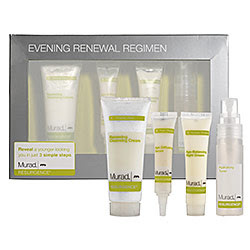 The Murad Evening Renewal Regimen is the perfect answer for my thirsty, aging skin!! Thank you for the contest! Thesun has done a number on my skin; I n eed lots of help!! HAPPY NEW YEAR! Fantastic giveaway! I'll be the billionth person to point out that the box isn't working, but I'd love to be entered! My skin really needs help... I really need this. my skin is in need of this! I love murad, haven't tried this line of theirs yet though. Thanks! My skin is crackling dry. Murad always helps me moisturize it back to normal. Please enter me in your awesome giveaway. Thank you. I would like to try these products. I am always looking for products to treat my skin. I would love to try these! kylie8cake@gmail.com Thanks!